Deadly Blast At An Austrian Gas Hub Prompts A State Of Emergency In Italy : The Two-Way At least one person was killed and many others injured when an explosion ripped through the hub. Fears of supply disruptions quickly caused energy prices to leap across Europe, especially in Italy. An explosion tore through an Austrian gas pipeline hub at Baumgarten on Tuesday. At least one person was killed, and now onlookers fear the explosion could send shock waves through the European gas supply. A fiery blast ripped through a major natural gas hub in eastern Austria on Tuesday morning local time, killing at least one person, injuring many others and sending energy prices into a frenzy. The blaze at the facility in Baumgarten, which receives imported Russian gas and sends it on to other sites scattered throughout Europe, danced bright on the horizon for miles around before firefighters were able to bring it under control hours later. Local police announced on Twitter that the blast occurred "due to a technical cause," adding that an investigation has been opened. 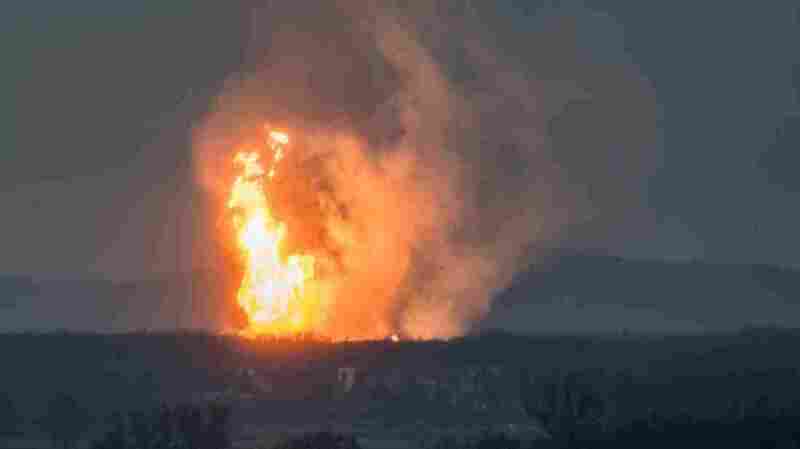 The site's operator, Gas Connect Austria, also preliminarily attributed the explosion to a technical cause and took the facility offline. Initially, the company said 18 people were injured — though local police later raised that number to 21, noting that one person suffered serious injury. The shock waves of the blast have already been felt far beyond the boundaries of the station, which serves as a crucial hinge point between gas suppliers in Russia and Norway and pipelines sending that gas on to Italy, the U.K. and other European countries. Gas Connect Austria says that after the explosion, "transit through Austria to the south and southeast is impaired until further notice." The explosion follows on the heels of news that an important North Sea pipeline was also shutting down because a crack in it had been discovered, the Financial Times reports. Italy, in particular, anticipates a painful winter as a result of the unexpected disruption. Not long after the explosion, Italy's minister for economic development, Carlo Calenda, declared a state of emergency for energy supplies. "Today there was a serious accident in Austria," Calenda said Tuesday, according to Reuters. "It means that we have a serious supply problem, with a great concentration from Russia." FT reports that "in Italy, day-ahead gas prices almost doubled, while Dutch prices also rose sharply." U.K. gas prices also leaped significantly Tuesday. "There is still plenty of storage across Europe to cope with this," energy consultant Massimo Di-Odoardo told the FT. "But if supply does not resume soon and the cold weather continues, prices will remain strong through the winter."